This installment of the Call to Arms-series clocks in at 41 pages, 1 page front cover, 1 page SRD, leaving us with a whopping 39 pages of content, so let’s take a look! Okay, I never thought I’d be one time in my career be reviewing a 40-page pdf that focuses on flames and torches. So what do we get? Well, following the at this time slowly arising standard of the series, we begin with a well-researched recapitulation of the history of fire as tool and weapon – as much as that is feasibly possible, mind you. For such a basic process, and one obviously popularized and charged with symbolic significance by the Dark Souls-series, it is pretty much surprising to research lighting fires and what the rules say on it – which is not much. In one of the trademark “why hasn’t this been done before”-moments, we are introduced to simple, concise rules for lighting fires, with a simple nomenclature: Sparks, tinder, kindling, fuel, embers. The rules are simple, easy to grasp, accounts for burning objects and provides easily inserted rules that don’t unnecessarily complicate matters – instead, we get concise precision, which extends to A LOT of examples for sparks, tinder, etc. – and similarly, the pdf collates the rules for extinguishing fires. And yes, solid math supports this. But beyond these components, the pdf sports two new materials – one would be fire-forged steel, which would be a subtype of steel that can channel heat away from the wielder, charging itself with fire when exposed to such…and no, it does not allow for flaming-abuse and actually has a kind of set-benefit when combined with armor made from the material. The second material would be the intrinsically magical pure fire, flames that have been solidified to the durability of metal – and yes, sans resistance or better, immunity, wielding such weapons or more stupid, wearing an armor made from the material, is just as hazardous as you’d expect. And yes, it can repair itself, is uniquely subject to antimagical effects and the like…and is simply interesting. Now, as per the series’ later issues, we also receive an excessive coverage of mundane materials that should have any low-fantasy gamer grin from ear to ear: From alcohol to fighting pitch or the flame fountain firework, there are a lot of interesting tools – including tabgleburn bags, keros oil, fuse grenades, flash powder…and even a catch-all entry for superheated substances. Similarly, tools of flames, from the classic bellows to amadou (highly flammable fungal material) to burning glasses, driptorchs and fire-resistant gloves – the tools of trade offered herein are diverse, detailed and offer a distinct, detailed dimension to firestarting you probably didn’t know you needed…but reading this…well, you do. 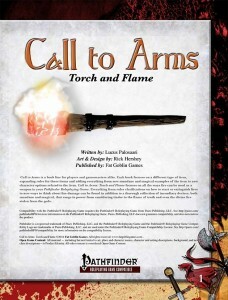 Now this pdf also sports a rather diverse array of magical items associated with flames – these include powerful armors that can absorb a limited amount of magical fire as well as a broad array of items utilizing the unique pure fire material, often interacting with class abilities like rage. Always thought that the limitation of flaming and flaming burst regarding magic enhancements of your burning tools of death were kinda lame? Well, improved and greater versions and an enchantment that ignites foes complement the material herein…and similarly, there is a quenching ability. There is also a hammer that enhances the channel heat ability of azers, a balor lord’s flaming whip and the like – even classics like the flametongue can be found reprinted here for your convenience. Braziers of conjuring fire elementals are similarly classics, but instant-campfire beads, everburning slow matches and the like can be considered to be interesting indeed. Need a fuse for underwater use? The fireless fuse with do the trick for appropriate underwater sabotage. Beyond goblin skull bombs and fire drums, variations of the necklace of (delayed blast) fireballs and the shirts of immolation provide an overall solid chapter. Cursed cloaks that immolate you, alternative spell-lists for staves of fire, Asha, the intelligent flame of truth – there are some intriguing components here. Speaking of cloaks and immolation – 3 mythic items, including the potentially explosion-causing cloak are also depicted in these pages. The proverbial divine fire is also codified in this book as a minor artifact, which is pretty cool and iconic…however, as a whole, the item-section left me with a craving I needed time to identify – after careful consideration, I found what irked me. Torches and weaponized torch-like items – there is a distinct lack of them in a book that features them in the header. Okay, azer-hammers may be nice, but know what would have been cooler? Hollow meteor-hammers filled with burning chemicals. Magical battle-pois. A quarterstaff whose ends can ignite in different flames, with different properties. Now I’m not going to hold it against the pdf that its focus is on the more mundane torches and specifically, on flame – but some odd magical and mundane weapons in that category would have been the icing on the cake. Oh, and then, there would be the handy rules-appendix, which codifies heat dangers, boiling water and steam, smoke effects, catching on fire and expands heated metal by providing 5 stages of heat, with modifications to hardness, damage while wearing it, damage to item caused and conditions incurred when used. Similarly nice: Molten material. Once again pure genius, though, would be the concise rules that allow for a fire hazard to be treated as pretty much a creature in combat, providing concise and captivating rules for encounters that are based on fire-control/escaping the flames, etc. Editing and formatting are very good, I noticed no significant glitches that would truly hamper the content herein, though I did notice some minor formatting hiccups. Layout adheres to Fat Goblin games’ two-column full-color standard and the pdf has solid, nice full-color artwork. EDIT: The pdf now comes with bookmarks! Lucus Palosaari has written a massive book on perhaps one of the most one-dimensional topics I could imagine – and he has wrested brilliance from its kindling-dry set-up. I expected to see heat-conductive material herein; even flame made into material. I expected the comprehensive, handy collection of material. What I did not expect, in any way, was how much I’d enjoy this supplement. From the firestarting-rules to the heating-stages of metal and finally, the rules for fire as a creature-like hazard to be fought – all supplemented by solid math, well-crafted components…wow. You see, the subject matter isn’t that versatile – what Lucus Palosaari has wrought from it is truly impressive to me: The alchemical items, magical items and the like are solid, sure, but alone they are, at least to me, as smart as they sometimes are, no book-sellers. Not even the smarter ones, though some “solid, but kind of unremarkable” ones can be found herein. But the three aforementioned innovations account for A LOT. Basically, this is the comprehensive fire-manual for Pathfinder and its brilliant components and ideas, sporting no less than 3 “why hasn’t this been done before”-moments and to me, they even offset the annoying lack of bookmarks. Let me state this clearly: This is a glorious resource on the theme of fire. I don’t want to miss this book at my table anymore and it is really handy to have as a reference tome for GMs – I’ll be consulting this time and again in the future. In particular survival-focused ´borderlands/wilderness-campaigns will have a field day with this book. That being said, I really do think the “torch”-component could have used some additional coverage and would have considered that more interesting than the fireball necklaces – but that’s, in the end, my personal opinion and will thus not feature in the final verdict. After some careful deliberation, my final verdict will clock in at EDIT: full 5 stars, +0.5 stars for the addition of bookmarks…missing my seal only by a tiny margin. This is an excellent resource I can recommend getting and a book that makes handling fires so much more compelling. You can get this awesome, handy book here on OBS and here on d20pfsrd.com’s shop! FYI, Fire-Forged Steel is from Paizo’s Ultimate Equipment.